Who's Got The Best Free Attraction Marketing Training? Is There Good Quality Free Attraction Marketing Training Available? Who's Got It? The art of attracting customers using valuable information is not only highly effective, but available free of charge. You'll take an inside look at best resources out there, and decide for yourself if they're moving the free line - or simply throwing a net to capture you. First, let's make it clear what Attraction Marketing comprehends: most business owners invest their entire budget trying to find the best way to hit their customers over the head and bring them to their store; they believe prime time TV ads are the miracle solution for any recession. That is not attractive at all! "Nobody who bought a drill actually wanted a drill. They wanted a hole. Therefore, if you want to sell drills, you should advertise information about making holes and NOT about drills!" It may seem logical, but for a company that is used to marketing "we've got the best prices" or "get 10% off your $10 purchase" it is a difficult concept to understand. But you know better, and now you want to find the best way to actually put attraction marketing to work for your business. What Free Training Is There? The Renegade University is the most comprehensive resource of the three, and it is also the most basic one. The university is geared towards entry-level marketers, who need help with the entire online operation: url redirects, forwarding domains, how to manage prospects/commissions, and offers a basic introduction to different free marketing platforms. The free university is a valuable resource, and it is undeniable the amount of content available in there. They're honest in their helpful approach, and there's absolutely no hard-selling, even though they strongly suggest Ann Sieg's Renegade Network Marketer ($67) book as a "textbook". It is clear the training is basic, but the amount of time devoted to each subject shows Mike Klinger's dedication to clearing all questions and solving all problems. The Renegade University is the first step to a more complete education at the Renegade Professional community. 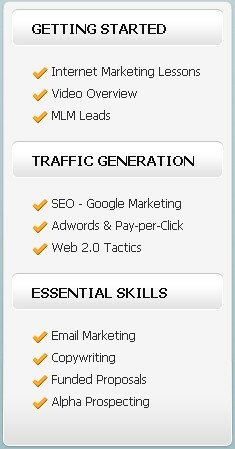 There, the training is even more comprehensive and there are more advanced strategies available. If you're already managing your own domain, knows how to set up a capture page, are not afraid of PPC, and knows how to set up a wordpress blog, you're probably better off without it. The "dynamic duo" Ferny Ceballos and Raymond Fong have put together their Formula: a massive 230+ pages book outlining 17 different platforms available for online marketing, including eBay and Ezines. I've had the honor of winning a copy of the AMF book at the Better Networker forum, and the content is dense! They include valuable tips on copywriting, optimized landing page design, and great tips on cheap PPC strategies. 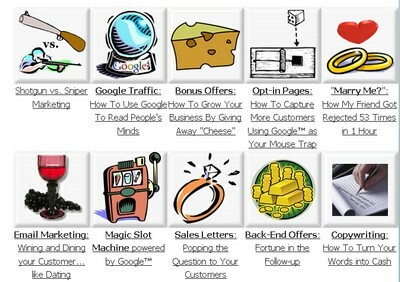 Their training, even though not as comprehensive as Renegade University, offers a more specific approach to attraction marketing, and engages industries other than internet marketing. They're the only one of the three resources to do so. You may not want to spend $297 on the full training, but their 10-day bootcamp is definitely worth signing up for. The dojo is Hiro Haneko's "Training Blog For Network Marketing (MLM) Professionals" and is a massive compilation of high-quality training along with product reviews. Hiro's content is also dense, and sometimes a bit redundant, but his blog posts are extremely valuable and his Dojo is the only of the three that offers the entire training in full, without requiring a sign-up and without promoting a specific product. It's also important to highlight Hiro's original writing style: he'd include article marketing and the TV show "lost" in the same post, making it all coherent somehow. That's impressive. Ferny & Ray, with the Attraction Marketing Formula! For having high-quality content, specifically devoted to attraction marketing. Their content is generic enough to be understood by beginners, applied by any business owner, and it doesnt involve hours of watching click-by-click videos on the computer. Plus, they have the coolest martial arts analogies to marketing, and they are newly-made stars that have paved the way to success through social media. 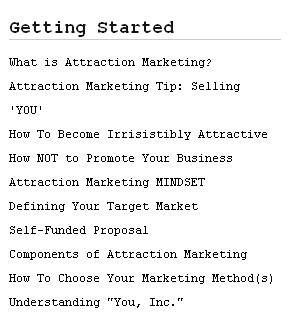 Check them out, and drink their attraction marketing knowledge. But what about this site? The your income potential training is soon to become a massive internet marketing resource; I have a passion for pay-per-click and am now getting into SEO, and I'll revamp this site to the pace of at least 3 new pages per week, all full of high-quality training. My recent posts on the magnetic sponsoring affiliate program and keyword research with google insight have received great responses and I've been told I should be charging for tutorials such as this one on how to integrate the funded proposal concept. The purpose of this site is to educate business owners online and offline about the many ways the web can increase their revenues. I wrote a complete training on integrating multiple marketing platforms to promote your business online, and I highly recommend it to all who want to take the next step leveraging the web.